Ludwig Hilberseimer’s contribution to the debate about the modern metropolis remains one of the most extreme if not one of the most original. 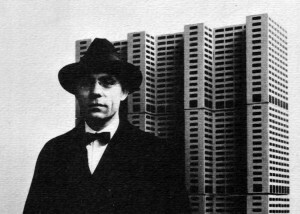 Architect, theorist and urban planner, Hilberseimer addressed the city, whose project he reduced to minimal structuring principles, with what could be described as a non-figurative approach, that is, an architecture without attributes which, for this reason, was able to overcome its formal crisis and re-claim itself an instrument of urban and political invention. A reluctant builder and prolific planner, Hilberseimer wrote several fundamental books such as Grosstadtarchitektur (The Architecture of the Big City, 1927) and realized, together with his close friend Ludwig Mies van der Rohe, one of the most impressive and today highly praised housing schemes in the postwar period: the Lafayette Park in Detroit. Yet his austere planning schemes have often been dismissed as reductive and as the extreme embodiment of modernist alienation. His rich corpus of theoretical writings, has not yet attracted the degree of attention devoted to other prolific theorists of his time. In spite of such limited critical acclaim, Hilberseimer’s work has inspired important and radically different (if not at times opposing) interpretations of the city and its project; these include Manfredo Tafuri’s critique of architectural ideology, Archizoom’s zero degree urbanism, Rem Koolhaas’s notion of Nothingness, K. Michael Hays’s analysis of the post-humanist subject in architecture, Charles Waldheim’s researches on landscape urbanism, Albert Pope’s studies on the ladder urbanism of North American cities, and Philippe Morell’s enquiries on architecture in the age of integral capitalism, to mention just a few examples. The conference seeks to map the original and unexpected ways in which Hilberseimer’s work and theories anticipate (seemingly) opposed contemporary urban paradigms, such as the generic city, and the emergence of ecological urbanism. Hilberseimer’s view of the structuring role of landscape and territory in the formation of cities can be linked to the emergence of the post-humanist subject and the possibility of a non-figurative architecture. The conference aims to rethink the legacy of Hilberseimer by retracing his projects and theories on the city through new and innovative interpretations that situate his work in light of contemporary urban problems. The main challenge is to rethink the meaning of his radical approach to architecture and the city in relationship with the role of welfare, infrastructure, large-scale design of cities and the emergence and crisis of 20th century forms of urbanization.